I had the opportunity last weekend to visit the town of Jim Thorpe, Pennsylvania. Jim Thorpe was the first Native American to win an Olympic gold medal for the United States. He won gold medals in the pentathlon and decathlon in the 1912 Olympics. The town of Mauch Chunk, Pennsylvania, was renamed Jim Thorpe, Pennsylvania, because Jim Thorpe is buried there. 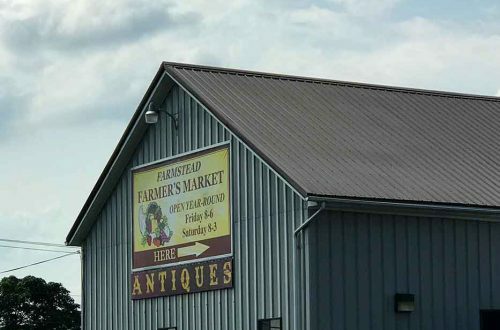 I’m glossing over a lot of history – some of it controversial and very heated – so if you are interested, I recommend reading more about the town’s name change here. Let’s fast forward to present day. 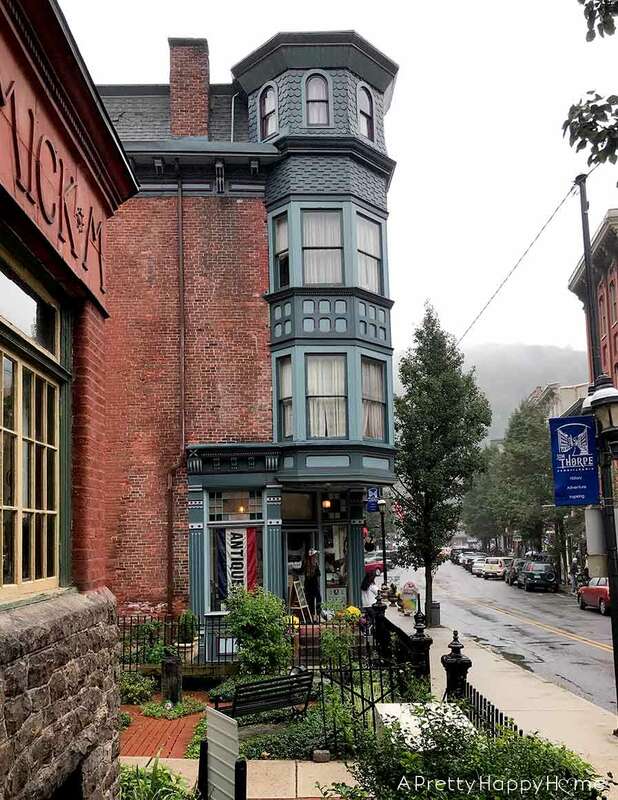 When you think of a postcard-perfect town, Jim Thorpe’s historic business district is it. It’s beautifully preserved homes and buildings from the 1800s and early 1900s are amazing. I could have spent all day walking through the town and not been able to take in all the architectural details. One of the stores I popped into was Antiques on Broadway. How could I not after seeing this entrance? 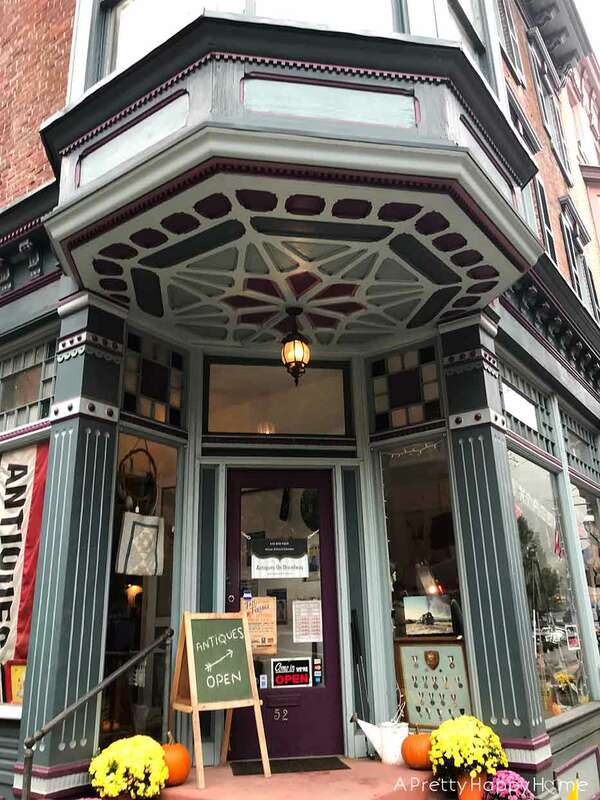 Antiques on Broadway was not big, but it had an eclectic and playful vibe that I enjoyed greatly. 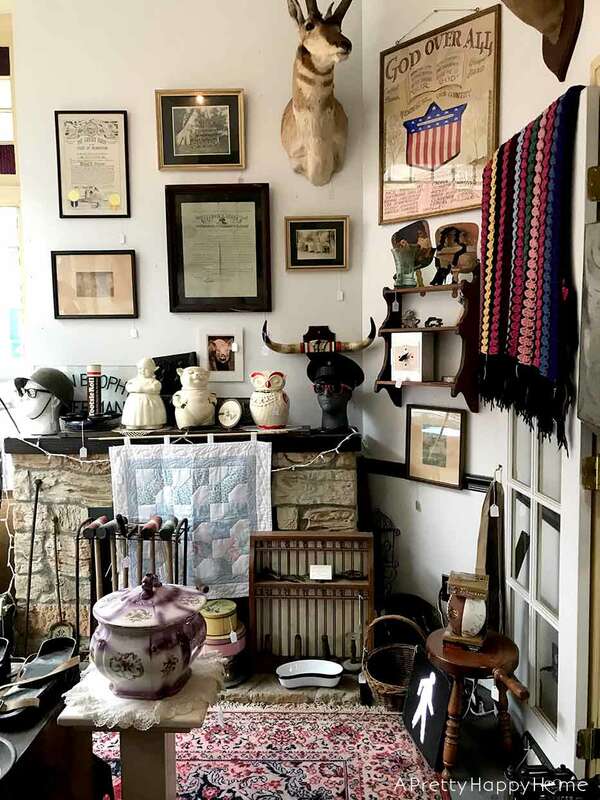 My impression from the merchandising and my staff interaction was that the owner (or staff) really knows their history, but likes to have fun too. See the sunglasses on the mannequin heads with military hats? Just a little tongue-in-cheek vibe there, don’t you think? 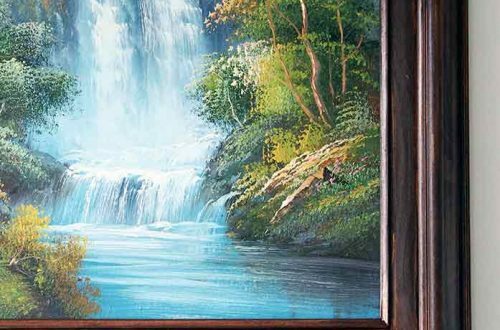 The “God Over All” band poster was $87. The dutch girl cookie jar (next to the Tootsie Roll) was $34. The quilted wall hanging was $28. Let’s move on to the below photo. 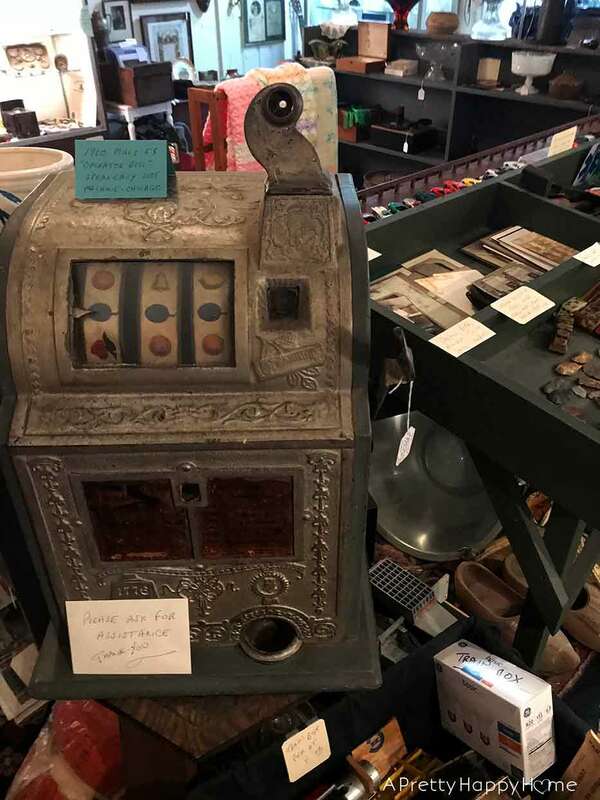 I’m not a gambler, but I sure was smitten with this antique slot machine! Have you seen one before? I haven’t! If a machine is going to take my 5 cents, at least let it be an ornately decorated machine. Am I right?!? The man working the shop told me the slot machine is a 1920 Mills 5¢ “Operator Bell” Speakeasy Slot Machine. It was priced around $1,200. From my quick eBay search, antique slot machines seem to be priced all over the board, so I don’t know if this is a good deal or not. As I was trying to learn more about this particular slot machine, of which little information exists, I learned that at the end of fiscal year 2013, it cost the U.S. Mint 9¢ to make a nickel. 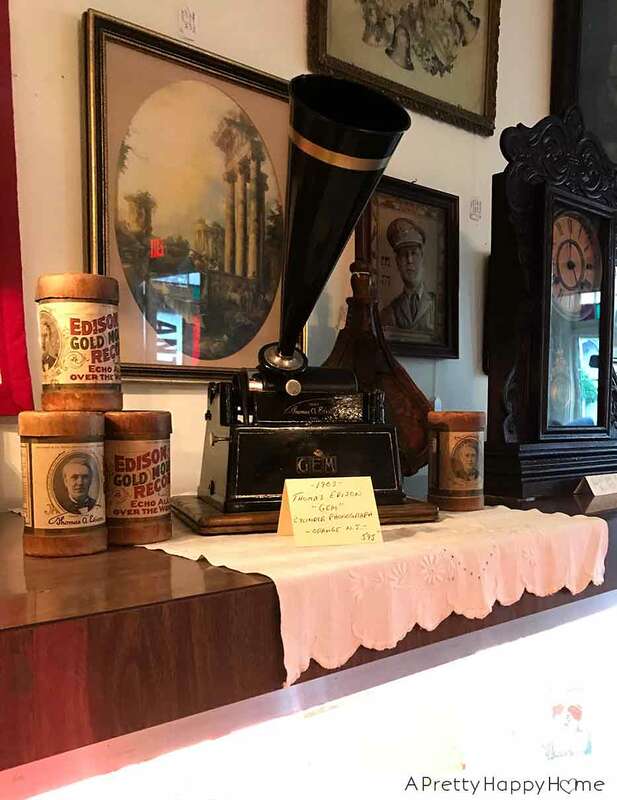 Antiques on Broadway also had a 1903 Thomas Edison “Gem” Cylinder Phonograph. 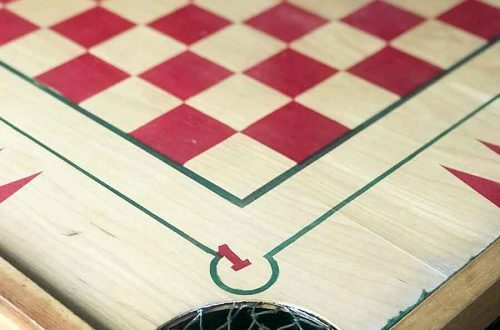 It was priced at $595. Edison actually applied for the patent on the phonograph on December 24, 1877. The phonograph was a success as a novelty, but it was hard to operate and the tin foil around the cylinder didn’t last long. When public interest waned, Edison stepped away from trying to improve the phonograph in order to work on inventing the incandescent light bulb. He later came back to the phonograph business in the 1890s. You can read more about the history of the cylinder phonograph here. 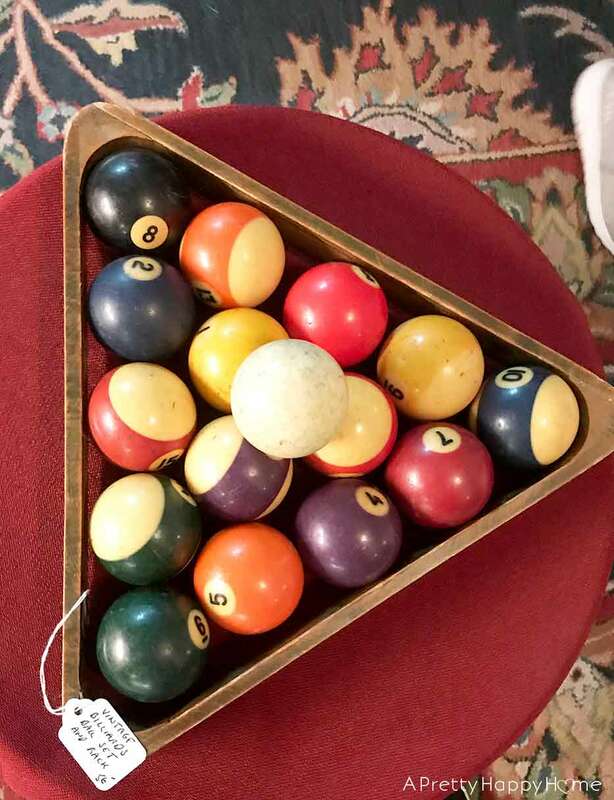 Last but not least, Antiques on Broadway was selling this set of pool balls for $56. You’d better bet I made a beeline for that price tag! Why? Well, do you remember my recent thrifting score that involved me buying a bag o’ balls? My pool ball set did not include the rack, but $3 for the balls seems like a steal now, doesn’t it? I can buy a new pool rack for around ten bucks, should the need arise. As a side note, I took a picture of the balls for instagram and it is very tricky to corral them without a rack. I did not buy anything at Antiques on Broadway, but I’m happy I stopped in to browse. Now, just wait until I tell you about the rest of the town of Jim Thorpe, Pennsylvania! If they haven’t filmed a movie in this picturesque town yet, they should!